No expensive visits to the doctor's office. We all know about women injecting Botulism Toxins (Botox® ) into their faces to look years younger. Today, A-list celebrities (names so big we cannot legally mention them here) are paying almost $200 an ounce for a youth secret so fabulous they&apos;re dropping their injections and using a cream that features a gently synthesized Snake Venom on their eyes, lips and foreheads. That&apos;s right, Snake Venom, the new, scientific alternative to injections that causes no frozen smiles, uses no dangerous toxins and no expensive visits to the doctor&apos;s office. 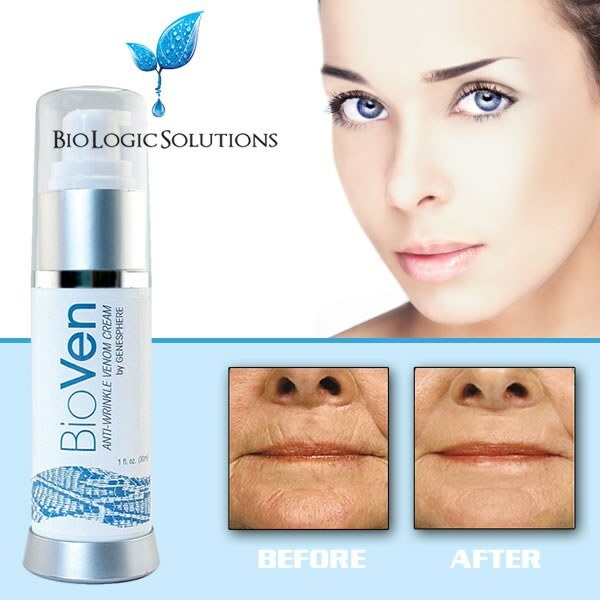 This fabulous breakthrough is now available in BioVen. Much like Botox, BioVen blocks the nerve signals telling wrinkle-causing muscles to contract. As muscles relax, old age lines diminish as BioVen helps prevent the appearance of new ones. You look younger today...and look younger for life using BioVen daily. And you won&apos;t pay $200 an ounce - the anti-aging division of BioLogic Solutions offers this amazing youth formula at a price every woman can afford. Start to feel and see the effects the very first day! And see the full effect in 4-5 weeks. It&apos;s new, it&apos;s safe and gentle, and it has Hollywood stars lining up to look years younger as Snake Venom gets hot while Botox does not. This exotic formula takes this synthesized version of the venom of the Temple Viper of Malaysia and adds the Collagen, Elastin, Youth Peptides and Anti-Oxidants your skin needs to look younger, healthier and fresher. A priceless new formula you use just once a day and enjoy the results for the rest of your life!